After searching around a number of stores, Pierateer RAS found his Higgidy pie in Co-op Stirchley (Birmingham). The packaging was very attractive, with a number of intriguing features including how the pie was made and the background love story behind the Higgidy brand, and a cheeky see through plastic glimpse of the pie in question. It immediately appealed and I couldn’t wait to get it in the oven. What must be pointed out, which you can’t tell from the photo, is the intricacy of the design of the pie, from the perfect shape to the small pastry pimples on the base of the pie which slightly lift the base from the baking tray to aid in the cooking process. These people clearly love their pies! The box states the pie was “lovingly made in Shoreham, West Sussex” and I can definitely feel the love! Onto the eating, after I take the golden pastry pie out of the oven, and my first impression when I cut open the pie is the steak slowly oozing out of the pie as I cut into it. The pastry is golden and perfectly held together. The pie is fully encased in pastry, with short crust pastry sides and base and a buttery puff pastry lid. It’s a delightful combination that works so well and this pie really pulled it off brilliantly. The pastry was not heavy at all and the lid perfectly crisp. The steak was tender and delicious, with my main query being a lack of bacon taste and a slight over packing of mushroom for my liking. 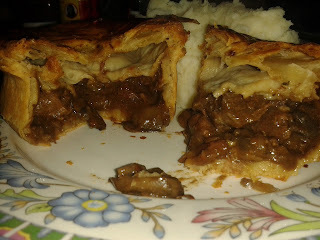 The chunks of steak were quite big to and could have been slightly better spread throughout the pie. The gravy certainly had a bit of a kick to it, with thyme and other flavourings adding to the gravy flavour. This certainly wasn’t your standard steak and ale but full flavour behaviour! While the pie could have been a bit bigger for the price (£3.49 for a 250g pie), it was certainly being sold as and delivered as a pie on the top end of the market. A bit more meat would have boosted it ever so slightly higher in the rankings, as it wasn’t at full capacity when you cut into the pie, but all in all this was a pie I certainly hope to eat again. While not part of the actual pie eating, it is worth noting that this Pierateer actually found it rather tricky to get his hands on this buried treasure! Rather than sailing the seven seas, it was more a case of searching the seven stores, as one by one I failed to find Higgidy pies on sale in numerous stores in central Birmingham. It does make me wonder why they aren’t more readily available, as they certainly score highly in my eyes and it was frustrating not to get my hands on these pies more easily! 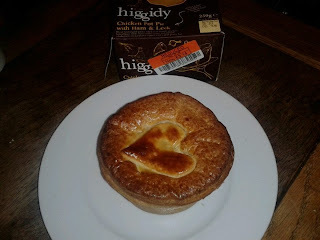 Here’s hoping the Higgidy marketing team get their pies out to the masses soon! 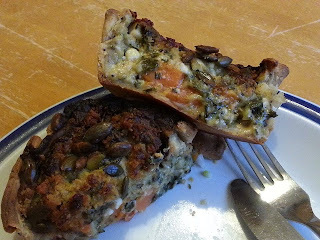 Introducing the sweet potato, feta cheese and pumpkin seed pie from Higgidy. Although difficult to source, this pie will have you asking why you didn't seek out a vegetarian Higgidy pie sooner. With a similar quirkiness to Pieminister, the box looks jolly and the pie looks tasty. And so it should, at a retail price of £3.49 ( although the nice folks at Higgidy were kind enough to spare us the expense, thank you!). It might be pricey, but the pie doesn't let you down. The feta gives a wonderful creaminess and the high quality pastry is lovely and crunchy. However, you'll note that the pie has no top crust! The Pierate rules on pie crust are quite strict, following the lead of the Melton Mowbray Pork Pie Association and the British Pie Awards. I have to say also that the colour of the inside of the pie is a bit strange, don't you think? However the pie arrived in excellent condition. The creaminess of the pie allows for a very smooth consistency. I am impressed, but not being fully encased in pastry is quite a downer. It took a long time to track one of these pies down but I finally found one in Co-op near Liverpool Street station. I could only find reduced pies because they were all on their sell by date. However the pie was still over £3 and seemed quite expensive for an individual pie. 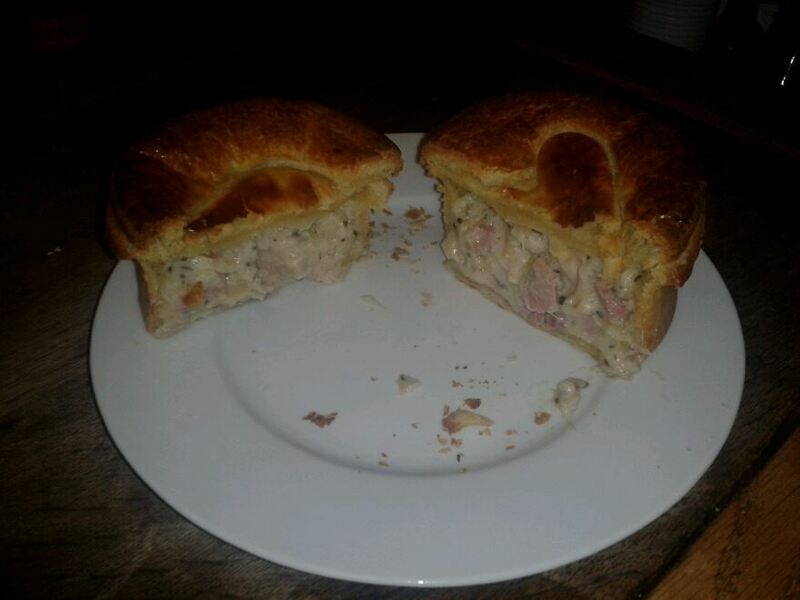 I picked up a chicken pot pie with ham and leek. However upon opening it the pie had an excellent height, which gave it the capacity one would expect from an up market pie. It looked resplendent once it came out of the oven, certainly one of the best presented pies I have seen in a long time. The shortcrust base and sides gave it a wonderful solidness. There was absolutely no collapsing in the oven from this one. This is, in my opinion, a quintessential example of how to make a proper pie. It also provided one of the best cross-sections I have ever seen in a pie. The filling had such viscosity that it stayed within the sliced pie. With a lovely golden colour it was already very high scoring on capacity, colour and condition. First impressions were that this pie had a full on flavour. Higgidy had opted for a cream and cheese based sauce rather than a traditional stock based sauce. It was consequently quite cheesy. There was also quite a kick of mustard in this pie which left it anything but bland. The meat was great quality and the numbers game shows that it was around two thirds chicken, ham and leek. Hugely impressive to have so much filling compared to pastry and sauce. The pastry had a good texture although it was pretty low key when compared to the filling. 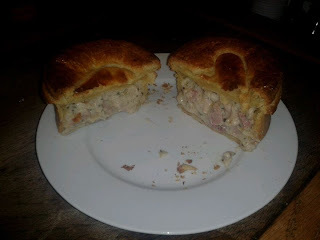 The Dijon style mustard, cinnamon, pimento and white wine vinegar left quite a continental taste in the mouth rather than what would be expected from a British pie. Not that this was necessarily a bad thing. It did taste nice, although the flavour verged on over powering. However it wasn't quite what I would be expecting when buying this pie. In fact it wasn't the kind of flavour I would expect from a pie at all. 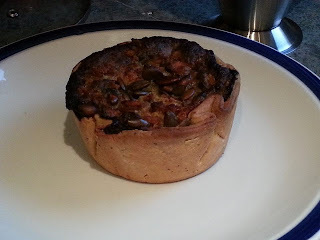 It comes as no surprise to me that Higgidy are primarily quiche makers and their quiches are much more widely available. I can't say that the choice of flavour particularly appealed to me. It was a bit too cheesy and after just a small amount I just didn't really want any more. It wasn't that it tasted bad but a pie should really leave you wanting more. Such a shame when it did other things so well. I was left with the inevitable question, would I buy this pie again? It is not the kind of pie you would expect to have in a pub with a pint of beer. While it is spectacular in its appearance it is too small to serve at a dinner party to impress guests with this refined specimen. However, it almost feels gratuitous to buy and eat such a gourmet pie by yourself. Perhaps then it is for taking on a picnic? However having to cook it, cool it down and slice it up doesn't seem practical. In fact this is perhaps an occasion that you might buy a Higgidy quiche for. At the price it comes as no surprise that I could only find this pie in London where people will pay to look like they have refined taste no matter what the cost. Would I pay full price for this pie? 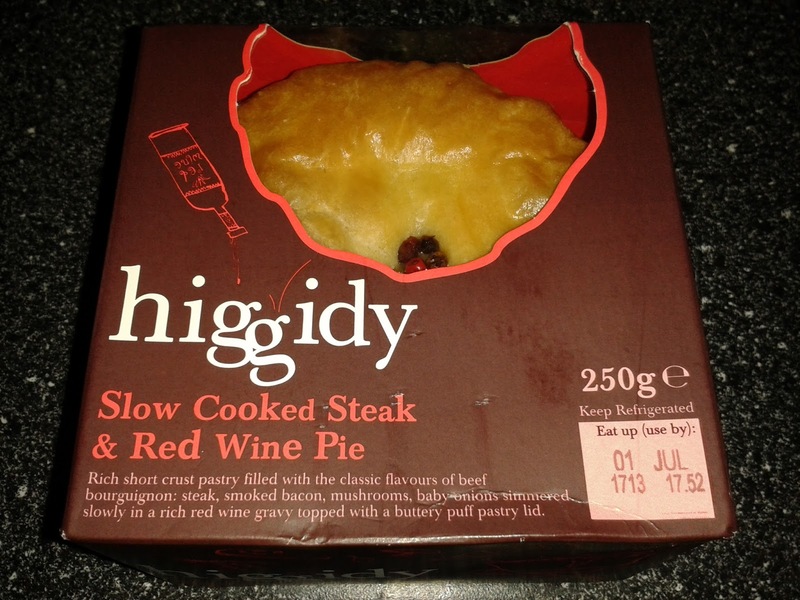 I think I might buy it again if only because of its archetypal pie appearance. However next time I might try another flavour to see if I can combine this classic pie look with a classic British pie flavour. Who will eat all the pies?